Today Chambers and Partners published their inaugural Litigation Support Guide, including PR & Communications. Maltin PR are a legal and corporate communications firm based in London. Clients appreciate the firm for being “very passionate about the cases they take on,” while a lawyer reports that “we were dealing with an organisation that gets badly beaten up in the press. The only firm we have used who have had any traction with this case are Maltin. Not a lot of the vanilla, large PR agencies could handle it.” The agency are also commended for “providing spot-on judgements” on how to engage with activists and agitators surrounding a case. 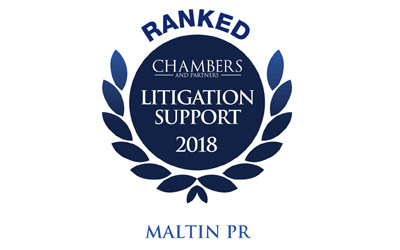 Maltin PR were engaged by Signature Litigation in relation to the GBP300 million RBS Rights Issue settlement, managing the press office and advising on general reputational concerns. The full Guide can be read online here.